Anyone that knows me knows how much I love Target! I am always shopping at Target and looking for fun items to create easy DIY crafts. 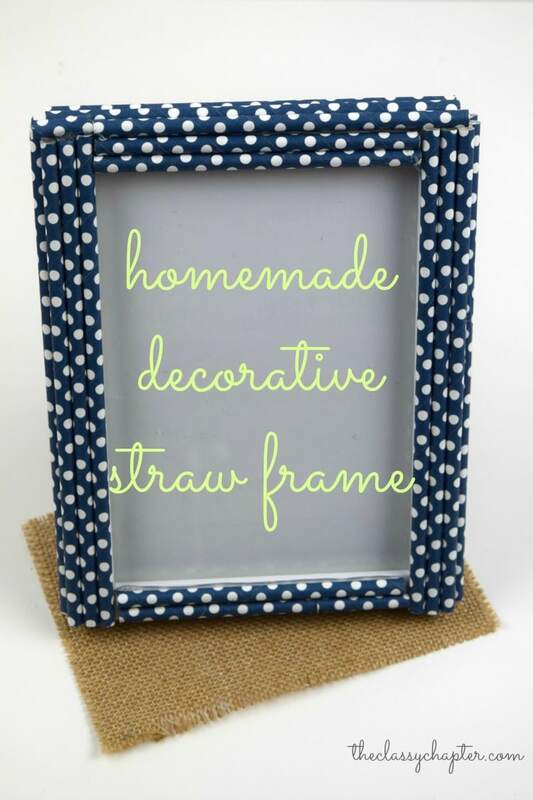 I recently came across some 5 x 7 white Room Essential Picture frames for just $1.99 and thought these would be a perfect way to use up some straws I had laying around the house. 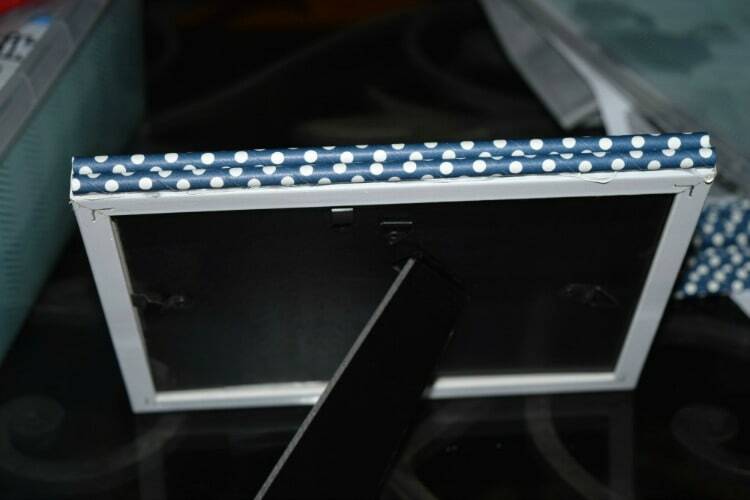 I rounded up all of my navy blue straws with white polka dots and went to work gluing them to my picture frame. This is such a fun project and you can use it for a decoration in your home, a Mother’s Day gift, senior graduation picture or anything else you can think of. Lay your frame on a flat surface and plug in your hot glue gun. 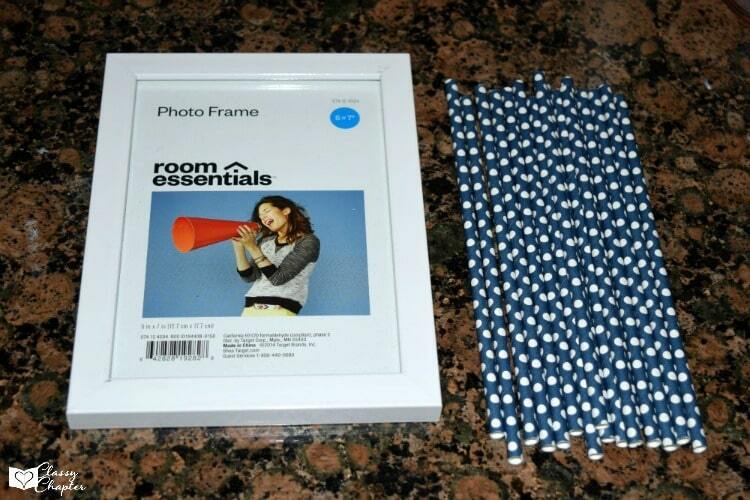 While your glue gun is heating up make sure you have at least 16 straws to cover the entire picture frame. To start, I propped my picture frame up on its stand and started applying straws to the side. Apply a line of hot glue and quickly apply your decorative paper straw and press down firmly for a few seconds. Add a second line of hot glue and add your straw pressing firmly. Each side will get 2 straws, each front side will hold 2 straws and you will add one additional straw at the crease to make the straws seamlessly blend it. Need an easy #diy project? Check this one out! Continue these steps for the next side. To do the front top and bottom, you will have to trim down the straw down to fit in the middle of the straws. That’s it. Put in a photo you’re proud to show off and show this masterpiece off in your home. This project is so easy you can most definitely let the kids help out! If you enjoyed this easy DIY project make sure you take look at my Pinterest boards for more! Haha, it’s never to early to start thinking about Christmas.